Transformation of HR functions from services that customers love to hate to a service that is judged to be an advocate of employees, a coach and support to managers and an ambassador of the organisation and employment brand. The achievement of real improvements in service as judged by the receivers of the service rather than the providers and cashable year on year savings in budgets. National roles both within employment and as president of the PPMA a role that she was elected by her peers. at numerous events, to contribute to articles in trade and national press and to lecture in a range of areas. Angela has lectured senior HR Directors in the USA and as part of her role in running the NPIA International Academy. Angela have been named as Personnel Director of the year 2005 at the Telegraph Business Awards, HR Director of the Year 2005 at the Personnel Today Awards and HR Director of the Year 2007 at the HR Excellence Awards. Human Resource Magazine named Angela in their list of most influential people in HR 2008 and 2009. She also appeared in Personnel Today's top 'power players'. Angela is the Past President of PPMA (The Public Sector People Managers Association) and was the first Civil Servant President in the organisation's 30-year history 2006/2007. Board Member of International Advisory Board, Police Executive Programme, Institute of Criminology at the University of Cambridge. 1. To set up a new agency and lead the merger of services from the Home Office and Centrex (the precursor bodies). 2. To develop the services and ensure that there was improved quality, reduced cost and greater integration with customer requirements. I led the development of the Leadership and People Strategies which were included in the Green paper. 3. To lead on budget reductions and a major reorganisation to ensure that the Agency is as economical as possible and able to cope with future transitions. Angela was the Head of profession for all HR and learning and development staff in policing in England and Wales and support their professional development through conferences, national standards and on line communities of practice. Angela was invited to join the CPS to lead the turn around of the CPS employment brand. Over the next five years she led the programme that resulted in a large number of National HR awards for excellence and the CPS became a model of best practice and featured in surveys as one of the top employers in the UK. In 1999 Angela was recruited into Enfield to improve the performance of the HR function. Within two years the authority had won a national award for HR Excellence and had one of the top Best Value reports from the audit commission for the HR service. 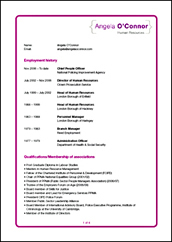 For more details about Angela's career download her full CV.